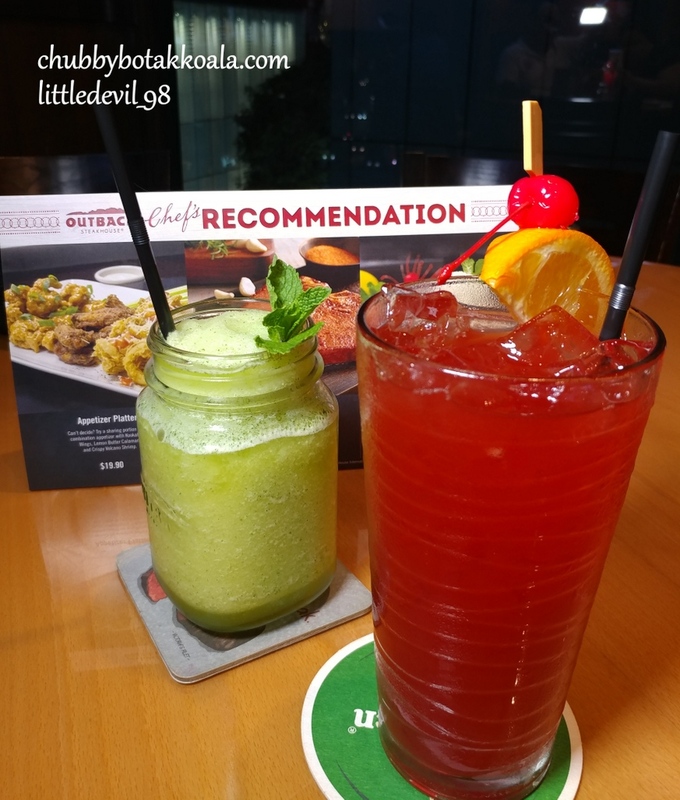 In August 2017, Outback Steakhouse Singapore launched a new menu that featured the 22 fresh and bold flavours that you will surely love, in addition to the perennial favourites. Our last visit to Outback Steakhouse was at their Millenia Walk outlet. The full review is available here. 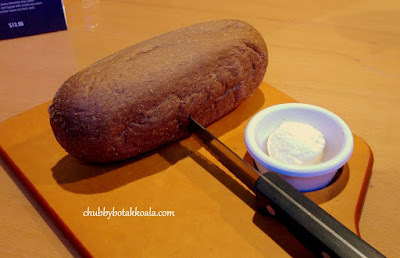 Accroding to the tradition in Outback Steakhouse, Honey Wheat Bushman Bread is served at the start of the meal It has a crisp crust, a touch of sweetness with a hint of cocoa. Served with their signature mix of their butter, that will definitely wake up your appetite. Appetizer Platter ($19.90) - A combination of Kookaburra Wings, Lemon Butter Calamari and Crispy Volcano Shirmps. We asked for the mild vision of Kookaburra wings. The secret spices is on the strong side, salty and need to be balanced with the blue cheese dressing. The Lemon Butter Calamari is crispy and springy, while the lemon butter sauce nicely complements the calamari. Without the lemon butter sauce, the calamari will be bland. The shrimp is surprisingly good. Crispy externally but juicy internally. The spicy sriracha aioli is creamy, without much heat in it. Our main meal is Chile Marinated Ribeye ($47.90). 10oz (about 284 gram) of Ribeye steak, grilled to medium rare. It is then topped with avocado pico de gallo (salsa). The steak is juicy and succulent, almost to the point it melts in your mouth. The avocado salsa with is freshness and acidity helps to balance the fattiness of the ribeye steak. 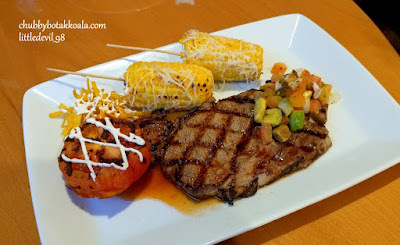 The steak is served with corn of the cob, crispy tortilla strips and grilled tomato. The corn is sweet with a solid smokey aroma, while the grilled tomato is thick and juicy. I personally think the tortilla strips does not contribute anything to the dish, hoping that they might replace it with tortilla chips instead. Tropical Beef and Rice ($15.90) - Sautéed Beef, Seasonal Veggies and Green Capsicum tossed with teriyaki sauce. Served with steamed rice and pineapple. This dish reminds me of my uni days in Melbourne where we can get this in a suburban Chinese Restaurant. The beef cubes are well caramelised, mixed with crunchy vegetables. The teriyaki sauce makes this dish a "Rice Thief", where you just can't stop scooping the rice. The pineapple will add balance to this dish with its sweet and acidic flavour. A simple combination that is just comforting, Yum. 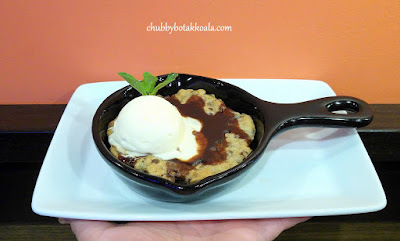 Dessert is Skillet Cookie ($13.90) – Giant and gooey chocolate chip cookie served in a skillet and topped with vanilla ice cream, warm chocolate sauce and fresh mint. Sweet and delicious, where the combination of hot and cold made it a perfect ending to your meal. Absolutely delicious. The décor of the restaurant is a combination of western tavern with Australian touch. The solid wood theme is feature prominently here. One thing for sure, if you are seated by the window, you can see the hustle and bustle of the Orchard Road from the top. 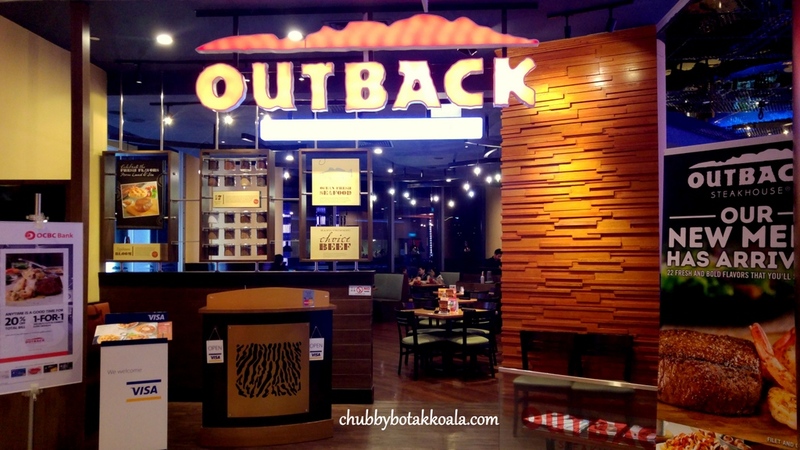 Overall, the new menu in Outback Steakhouse is inspired by flavours of the world. Kudos to them for incorporating Teriyaki sauce, Avocado pico de gallo and Sriracha aioli in their ingredients. Instead of sticking with the oldies, they welcome the flavours of the world to their table. So if you are around Orchard or Suntec area, check out Outback Steakhouse. Cheers! !